At a recent party I encountered a Mexican treat that I’d never heard of. 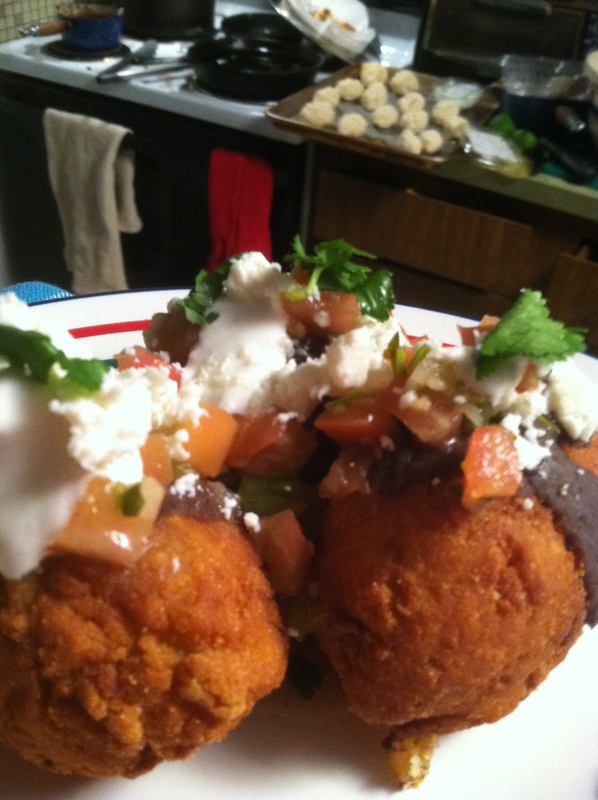 It was described to me as a dough made of masa harina (fine cornmeal with lime) wrapped around chorizo (Mexican sausage), potatoes, and cheese, fried and topped with black bean puree, salsa and queso fresco. I put one on my plate, sat down and dug in. It was so good—an irresistible combination of flavors and textures—that I hopped up to get another one. But it was too late; they were gone. So I decided to attempt my own. I found a bunch of recipes in magazines and online and set off. I mixed 4 cups of Maseca with 1/3 cup flour, 1 tablespoon of baking powder and 1 teaspoon of kosher salt. Then I warmed up about 3 cups of water with 2 tablespoons of lard (I bet shortening would be fine). 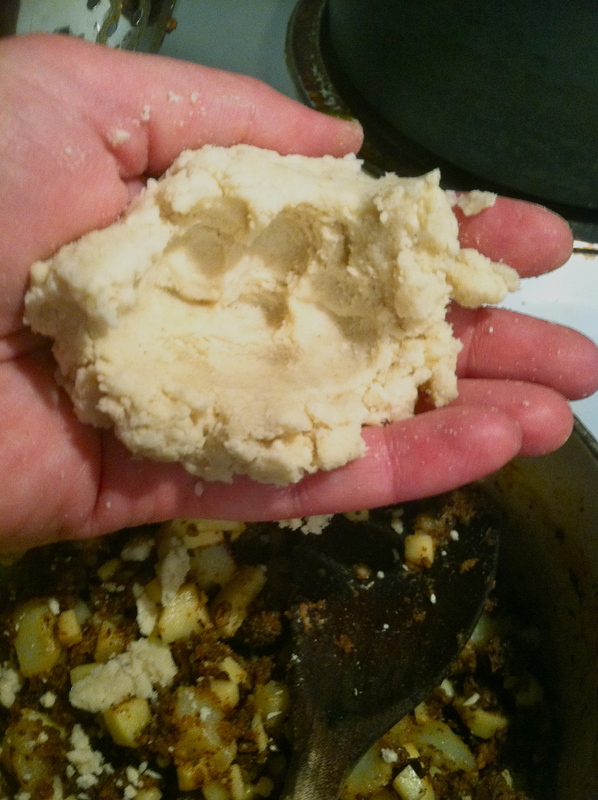 I mixed the water into the flour mixture gradually until it made a dough that would hold its shape and not be too crumbly. The masa harina dough ready to be filled. Meanwhile I boiled two medium peeled and diced red potatoes (1/2 lb.) until they were tender, then browned 10 ounces of Mexican-style chorizo I made last week, similar to a recipe in Diana Kennedy’s The Cuisines of Mexico (Harper & Row, 1982). When it cooled I mixed in about 4 ounces of diced Monterey Jack cheese, and that was my filling. 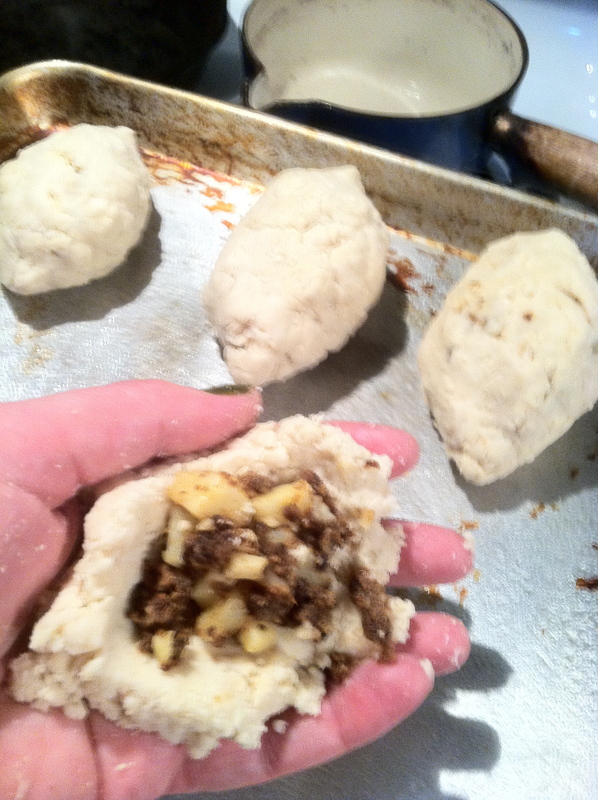 Molotes dough holding the stuffing. pressing to contain and seal the filling, then I shaped it into a torpedo, or football shape, about 3 x 1 1/2″. I thought how great these would be for a Superbowl party if I was throwing or attending one. As I assembled the molotes I put them on a cookie sheet I’d sprayed, and then fried them in vegetable oil until they were golden, turning halfway through. Once the molotes were drained on paper towels, I put them on a plate. On top went a drizzling of black bean puree that I’d made with dried beans from another of Kennedy’s recipes, frijoles de olla, then pureed with my immersion blender. Then I ladled on some My Brother Bobby’s Salsa and over that some fake crema I’d made with sour cream, lime juice and lime zest. Next was crumbled queso fresco and some fresh cilantro leaves. Radishes as a garnish would have been appropriate but I didn’t bother, this time. Authentic, probably not. I think I have a lot to learn when it comes to molotes. They were fun and tasty, but there are a couple kinks to be worked out. There was too much dough in proportion to filling, so that technique needs to be refined. I need to contact the woman who made them for that party and ask her for her molote secrets. Once I get it perfect I’ll provide a real recipe in this space. Has anyone out there made molotes? 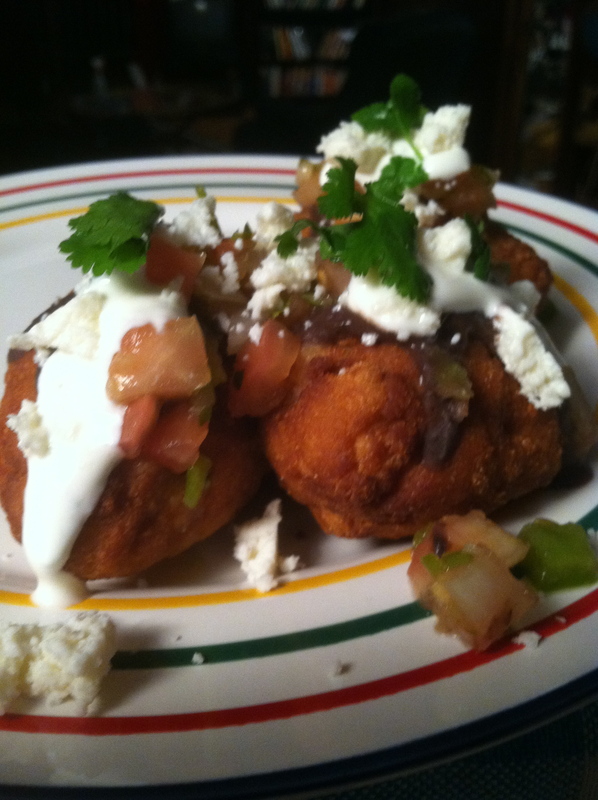 The finished molotes. At the back of the pic you can see the uncooked ones next to the stove, ready to go into the oil.